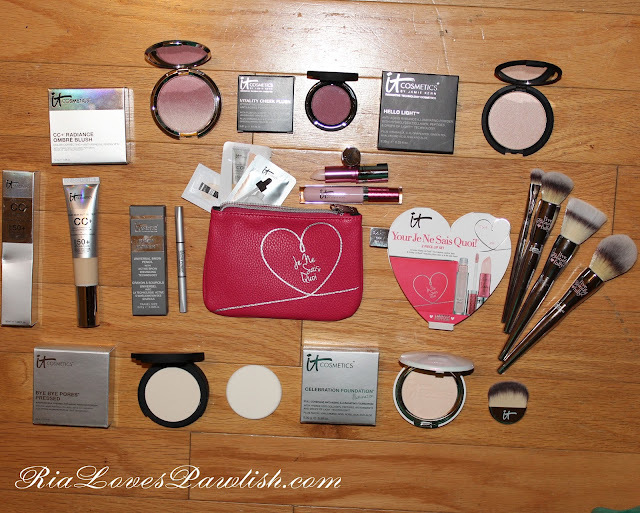 Ria Loves Pawlish: Ulta ULTAmate Rewards Haulage! had a jump lesson today, Echo was super good! this was excellent as i didn't feel very well... i probably shouldn't have been riding at all... but, you only live once, right?! got a lot going on the rest of the week... Mama Pawlish is having a biopsy tomorrow, and we won't find out if it's something bad or not until over a week later :( i'm praying hard that it's nothing! i don't do many haul posts anymore, but i thought it would be fun to share what i got with my Ulta ULTAmate Rewards :) i always save up my points to 2000 as you get $125 to spend in store on anything. 2000 points is the cap, you'll start saving up for another 2000 after that... but you get more money to spend if you build them up. i try and be smart about them, and when i get 5x the points or something like that, i buy skincare and other higher ticket items. then i wait for a 20% off coupon that includes prestige brands, and i really score! i had 4000 points ($250!!) to spend, so i got loads of great stuff!! i decided to use my points to try out It Cosmetics... and they are awesome! i also got several It Cosmetics brushes for Ulta from the Live Beauty Fully line, which i already was in love with. let me know if you spy anything in the picture you'd like a review on... there isn't a dud in the bunch!